Port Hedland has a great sporting tradition. Football, cricket, tennis and nearly every summer sport invented has been played in the Town. 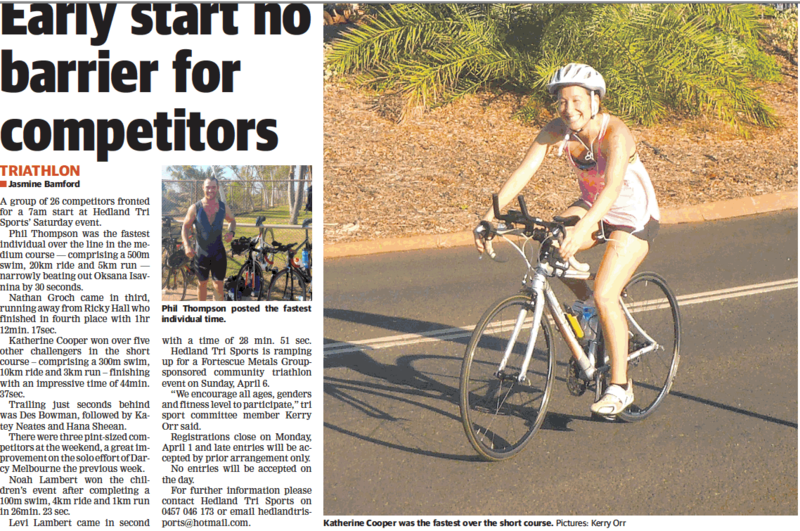 Now triathlon is reaching the headlines of the North West Telegraph sporting pages. Triathlon is three events rolled into one. A swim to wake you up, a bike ride to enjoy to location, and a run to check your fitness to complete the event. There are many ways to enter the sport of triathlon. Start by entering an enticer event. The distance varies, but most start with a 300 metre swim (6 laps of a 50 metre pool), 10 km bike ride, and 3 km run. Triathlon lots of fun and can be addictive after a while. There is lots of great gear to buy to look the part and feel great participating. Enjoy.